We’d love your help. Let us know what’s wrong with this preview of Vintage Beer by Patrick Dawson. To ask other readers questions about Vintage Beer, please sign up. Fantastic book for those even remotely interested in cellaring beer. Dawson has written a book that is both easy to read, and extremely informative. I can see myself referring back to this book to recall things he's taught me. I could have done with a few less beer reviews, but it was nice to see. Very easy to read and very informative about informing you of what happens when you age a beer and why some styles are better than others to age and why some you should always drink as fresh as possible. I will continue to use this as a reference. 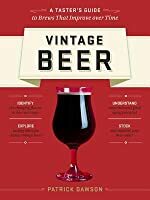 Covers the basics of aging and aged beers quite well, with the addition of some practical tips, suggestions and tasting notes. I'll admit, when I first picked up this book I didn't know a thing about aging beer. I'm happy to say that now I know a decent amount. Aging the right kind of beer with the right environment can develop new flavors and create an entirely different experience. This book is very approachable. I liked that the beginning starts off with a personal story of the first time the author tried an aged beer. The writing is complex enough to get the point across yet simple enough that I understood almost ev I'll admit, when I first picked up this book I didn't know a thing about aging beer. I'm happy to say that now I know a decent amount. Aging the right kind of beer with the right environment can develop new flavors and create an entirely different experience. This book is very approachable. I liked that the beginning starts off with a personal story of the first time the author tried an aged beer. The writing is complex enough to get the point across yet simple enough that I understood almost everything. There were only a few things I had to ask my homebrewing fiancé. It starts off explaining what exactly makes a beer a good one to age, then moves to what different styles work the best. I found the information on tasting especially interesting, explaining the factors to look for when tasting any beer. There are also sections on how to make your own beer cellar as well as how to manage it. If you want an immediate taste of an aged beer, the appendix provides different bars that serve them. The photography in the book was beautiful and vibrant. All of the charts helped to present information in an easy to understand manner. Now I want to try the process of aging beer! I recommend this book to any beer drinker. Read this sometime last year after picking up in Anderson's bookstore. Very fun and informative read on beer tasting and aging or 'cellaring'. With all of the talk within the craft beer community on cellaring beer, it was extremely interesting to note just how very few brews are indeed cellar worthy. Long story short: the vast majority of beers are meant to be enjoyed fresh. If you are thinking about beginning to cellar your beers, this book is for you. It will ensure you know what you are doing Read this sometime last year after picking up in Anderson's bookstore. The thought of aging beer may have never crossed your mind. Dawson creates an easy to read, well thought out explanation of what styles of beer age well and others that do not. There is a guide in the back that takes you though certain beers' flavors over a 14 year period. This book is great for craft beer drinkers who want to take their hobby to a new level. It's also good for home brewers who may want to start aging their ales (and lagers) to a new level. I am going to be perfectly honest, before I read this book I had no idea that beer could be aged. However, after reading this book I am really considering trying this out. This was a really interesting book about beer, and I really enjoyed it. If you are a homebrewer check this one out. Received copy to review from NetGalley. Pretty good read. The author does aim at the American market but refers constantly to European beers. Whilst not alienating, as a Brit, it would have been nice to be directed to beers and vintage beer bars commonly found in the UK. That's my only real criticism. The writing is great and pretty concise (if occasionally cheesy). The pictures are well chosen. Recommend for all beer lovers. Fascinating wealth of knowledge in compact form. Lots of chemistry to retread a few times for it to sink in. A list of cellar able beers, some of which I've been unimpressed with "fresh" as well. I don't know that I'll ever have the patience to sit some beers for as long as he did - ten years! wow! The longest I've aged a beer is 18 months. Still...food for thought. Or, rather, beer for thought. Aging beer? Isn't that the opposite of what you do with it? Well, after picking up this book, I've come to find out that about 1% of beers crafted today actually do better when aged. This is a great book for any beer aficionado! This is a low threshold must-read for any fan of craft beer with an interest in cellaring. A quick and easy read with a combination of both technical and practical insights. I have to say that I definitely acquired some useful information as a result of reading this book. Well worth your time. Short read but filled with great information for anyone interested in aging beer and the processes that take which make cellaring of beer worthwhile. I imagine I'll be using it as a reference for some time. God og grundig bog. Nyttig viden og fif. Blev meget tørstig. Må! Have! Ølkælder! It's the most comprehensive book on cellaring and aging beer I've ever seen. This is an absolute must read for all beer geeks, nerds, aficionados, and even the snobs among us! 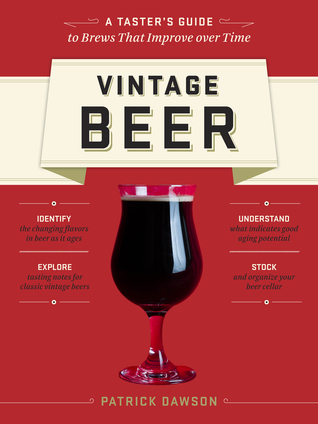 A pretty cool guide to high quality aged vintage beers and aging your own beers. Dawson could have been a bit more brief in some areas and a bit more in depth in areas like sourcing and pairing. Loved this short but information-filled book! Can't wait to search out some classic brews and track how they change. Cheers!